With summer just around the corner, many of us are beginning to wrap our heads around our next holiday escape or being beach bound in a bikini. For some, this notion can bring about some very real anxiety, especially if you’ve had a bit too much fun and overindulgence these past many months. As women, we can be so hard on ourselves, but it’s time to release that mindset and put action behind that anxiety. We can’t change what we’ve already done, but we can certainly move forward making better decisions and with the power of positive intention. Let’s drop the guilt and let’s craft a plan of attack to get your bum back in gear and ready for your sizzlin’ hot summer bod! With so many questions from what to eat to where to begin, there’s no doubt it can be a daunting undertaking. Sure, we want to look and feel our very best, but good health should always remain on the top of our to-do-lists. A training program can certainly become monotonous if we don’t shift gears and mix in a few new tricks on occasion, even for those of us with years of experience. Not only that, but time and time again we’ve heard just how smart our muscles are and learn that through adaption, we no longer experience the results we are looking for. 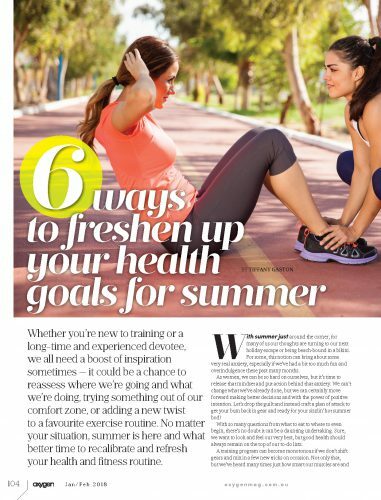 So, in the spirit of summer coming whether we like it or not, we’ve compiled some great tips on how to bring yourself back to center and set out on your next mission: Operation summer bod! We must first establish what we are seeking to accomplish prior to getting our game plan in place. Write out your goals so they become real to you, post them somewhere visible and read them a few times a daily. When we write things down, they become more than just a dream, they become more tangible in our minds and better serve to hold us accountable. Make sure they are realistic and attainable for you. Short term goals that can be applied daily will yield amazing results, so grab your notepad and consider creating a vision board and set a new standard for yourself. We will all have good days and bad, but just the fact that you’ve set a goal and put motion behind it already puts you light years ahead. Many of us know what to do, but the drive and desire may have fizzled out a bit. A great way to overcome a fitness plateau is to consider hiring a coach or personal trainer, if even just briefly, to get us back into the mindset of what hard work feels like. Someone to give an outside perspective, to push you harder and to check-in with, will hold you accountable to those goals. You may well know what you’re doing, but even an accomplished athlete utilizes a coach for their expertise and it may give you a different take on your training and approach altogether. Power in numbers people! Sure, we may all become a bit lacking in the intensity department, especially when we become bored with what we are doing, but we can get our passion back again when we enlist the assistance of a friend. That friend may even need a swift kick in the pants themselves. A training partner will hold you accountable, help spot you so you can safely go a bit heavier on your lifts and you can help to challenge each other. It’s a win-win situation for all! A change of scenery can reinvigorate your excitement for your training. Sometimes we get too comfortable with where we are and lose sight of our health and fitness goals. Trying a new style of training or even a new fitness establishment can spark your desire once again and you may even find a new passion in the process. If you are used to performing the same type of workouts day in and day out, consider checking out a new gym or a new style of training. From CrossFit, TRX, kickboxing, a group training environment and everything in between, there is something new and exciting out there for everyone. Sometimes, even a 5K, obstacle course race or registering for a fitness competition can get you excited again! No different than goal setting, why not set our sights on a New Year’s Resolution now, rather than waiting until the first of the year? If we get a jump start now, the indulgences of the holiday parties and weekend festivities will be a little easier to maneuver and you’ll be smooth sailing come January 1st! Being held accountable is one terrific way to ignite the fire inside and get moving. Here at Oxygen, our 12-week challenge will help motivate you into motion! Offering support, workouts, a meal plan, (including both vegan and gluten free options) a private Facebook group, modified options for all fitness levels and two different program options to suit your individual goals, this is sure to be a great way to catapult you into a fresh, new mindset! Look no further than our Oxygen 12-week challenge which includes all of the above to help get you on your way to your own personal best beach body.